When I was growing up I hated the smell and taste of chives, specifically Chinese chives. I remembered encountering Chinese chives in stir-fries with ground pork or shrimp, or sprinkled on top of steamed rice cake. I would always pick the chives off carefully before eating. I do not recall when it was that my palate changed and I began to enjoy Chinese chives. Now I don’t just enjoy them; I adore them. Chinese chives are often called garlic chives in America. Their leaves are flat and have a very pungent garlicky flavor. You can buy them in various forms. Among them are regular green chives (韭菜) and yellow chives (韭黃), which really is the same plant grown in darkness. And as what I consider the most wonderful form, chive blossoms (韭菜花). I love the blossoms because the flavor is very intense and they have a nice crunch when cooked. The yellow chives on the other hand have a subtler flavor and delicate texture. The strong flavor of Chinese chives make them unique in terms of their use. They are best paired with ingredients that have less pronounced flavor. Pork, shrimp and other seafood are all suitable for stir-frying with Chinese chives. Alternatively, they can be used as aromatic in a recipe; such is done in meat dumpling. 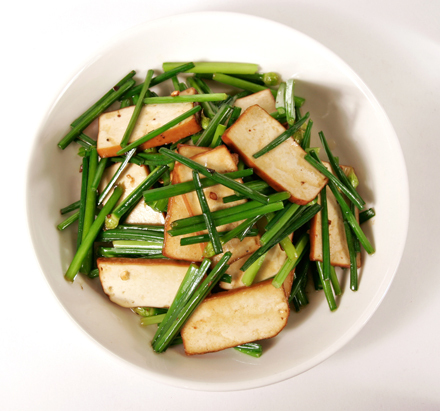 A favorite combination of mine is a stir-fry of Chinese chive blossoms with pressed tofu (豆腐幹), which is often smoked or marinated in spices. (You can use any of these varieties for this recipe. 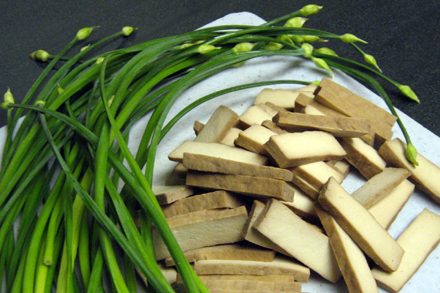 You can buy both Chinese chive blossoms and pressed tofu in Chinatown markets.) This is a very common everyday dish served at home, but there’s nothing simple about its flavor. The combination of the firm tofu texture with the crunchy chive blossoms is just incredible, and the sharp garlicky taste is enough to send you to flavor heaven. 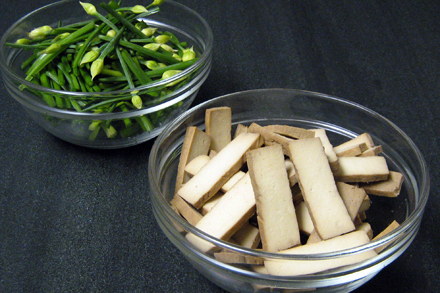 Cut the chive blossoms into about 2-inch long pieces and the pressed tofu into 1/8 inch thick slices. Heat the vegetable oil in a very hot wok until just about smoking stage. Put the garlic in the wok and stir-fry for about a minute. Put the pressed tofu and chive blossoms and Shaoxing wine in and continue to stir-fry for about another 2 minutes. Add the salt and pepper and chicken stock or water and continue to stir-fry for another 2 minutes. By this time the chive blossoms should be just cooked and the tofu heated through. Immediately plate the dish and serve. This is my favorite dish. Kids don’t like chive and always pick them out when I cook this one. Fannie, I’m so pleased you’re exploring the entire blog. Keep commenting! 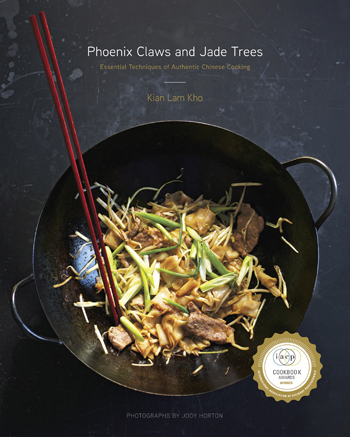 Chive blossoms can be used in many different stir-fry dishes. I will post a few more recipes in the future. red cook’s recipes are always so high quality. this Bloomin’ Chinese Chives are worth trying. Thank you for your wonderful articles and recipes! You have inspired me in the last few weeks and I tried this recipe. I have never cooked these chives before now, and I love them! I often see this vegetable at the Taiwan wet market but never buy them. I surely will try your recipe next time I buy the chinese chive. Thanks! Excited to try this! Thank you for sharing the recipe. What can one substitute for the Shaoxing wine if we don’t have it available? You can substitute Shaoxing wine with dry sherry. They both have similar flavor profile.